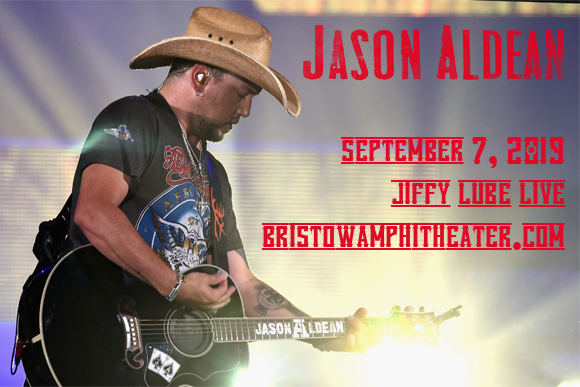 It's time for one of country's biggest names to take to the stage as Jason Aldean comes to Jiffy Lube Live on Saturday 7th September 2019 on his Ride All Night Tour! Named after a track on his latest album, Rearview Town, the tour will see Aldean whipping the crowd up into a frenzy with his larger-than-life performances, epic stage production and fan favorite songs! Joining Aldean in support is chart-topper Kane Brown! In 1998, aged 21, American country singer Jason Aldean signed his first ever record contract with Warner Chappell and made the move to Nashville, Tennessee, aiming to embark on a music career. Aldean's deal with the label never amounted to anything and in 2005, after seven years of rejections and broken deals, he gave himself six months to secure a recording contract, intending to move back to his native Georgia if he did not. Five weeks later, he was offered a deal from Nashville's Broken Bow Records, with whom he has since released eight albums. Aldean's self-titled debut album was released later that year to instant success, launching three top ten singles (including his first number one, “Why”) and earning platinum certification. To date, Aldean has released three platinum-certified albums, as well as the double-platinum certified album Night Train (2012) and his 2010 quadruple-platinum-selling album My Kinda Party. He has also charted twenty seven top ten singles on the Hot Country Songs or Country Airplay charts, including nineteen number-ones. Rearview Town, his most recent album, was released in 2018.